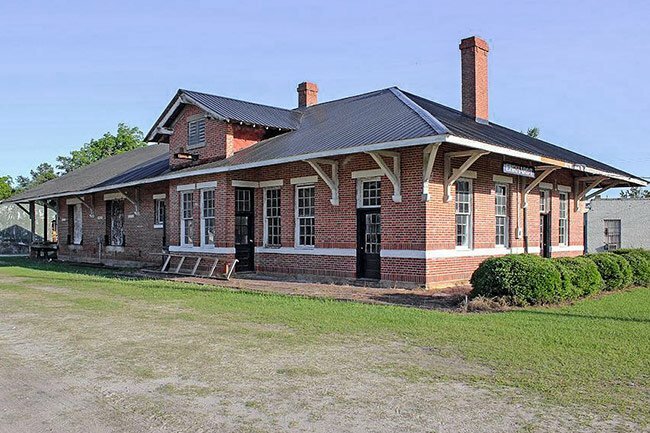 This brick depot in Ehrhardt was built between 1915 and 1916 to serve the Bamberg, Ehrhardt, and Walterboro Railroad, established in 1915. Ehrhardt was settled in the 1860s when German immigrant Conrad Ehrhardt, who came to America in 1851, relocated to the area following the burning of his sawmill along the Little Salkehatchie River. Without a water source to power a new mill, he instead built a boiler for steam power. Before long, Ehrhardt had built a new steam-powered saw mill along with grist and flour mills at his new site. As people moved to the budding industrial town, Ehrhardt added more buildings, including a general store which also housed the town’s first post office, established in 1876. In 1898 the town was chartered as Ehrhardt; that same year, the Atlantic Coast Line Railroad built a rail line from Green Pond to Ehrhardt. The store and post office building also served as the town’s first train depot. 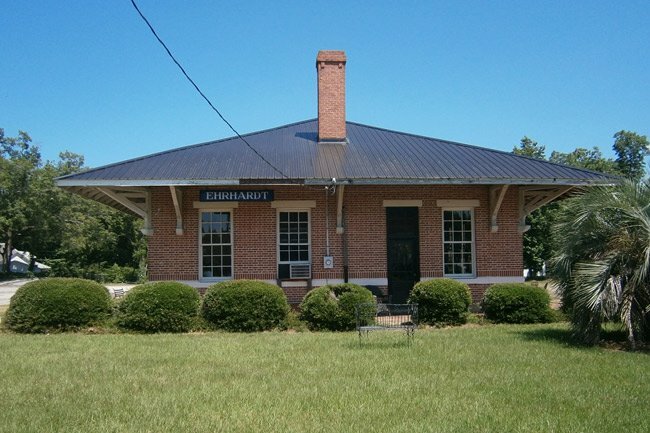 In the early twentieth century another rail line was built in Erhhardt to serve Bamberg, Ehrhardt, and Walterboro. Called the BE&W, the route was mockingly referred to as the “Be Early and Wait” line. 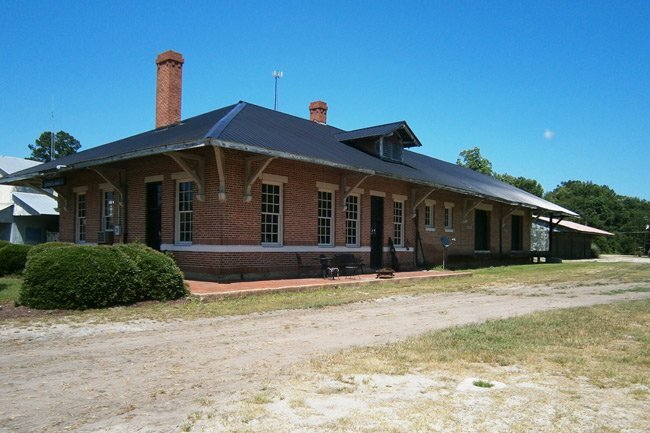 The line was never completed and failed to reach Walterboro, though it served the two Bamberg County communities of Bamberg and Ehrhardt. It primarily transported workers and merchants for 14 miles between the two towns and also carried freight such as lumber and watermelons. The BE&W leased its rail line to the Atlantic Coast Line Railroad shortly after it was built. The BE&W operated until 1938. 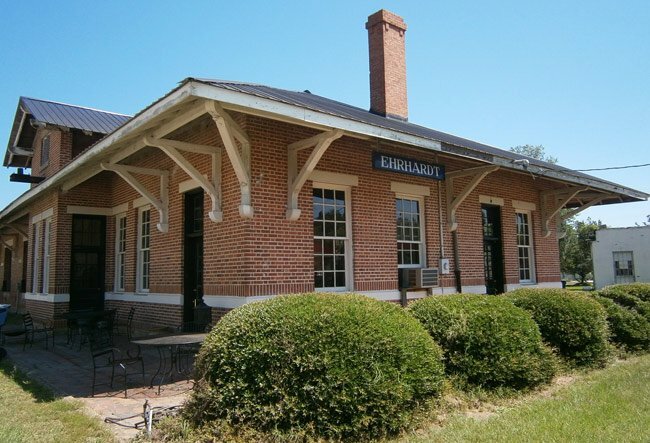 Today, the town is void of any railroad tracks, though the former depot still stands in the heart of the town. It is privately owned.